Are you mystified about how to plan for your retirement? You want to know when you can retire and what your retirement income is going to be. But you don’t even know where to start and how to go about it. This is the newsletter blog post which is finally going to reveal the secret. I am going to explain how I create a retirement plan. I am finally going to reveal all the secrets. 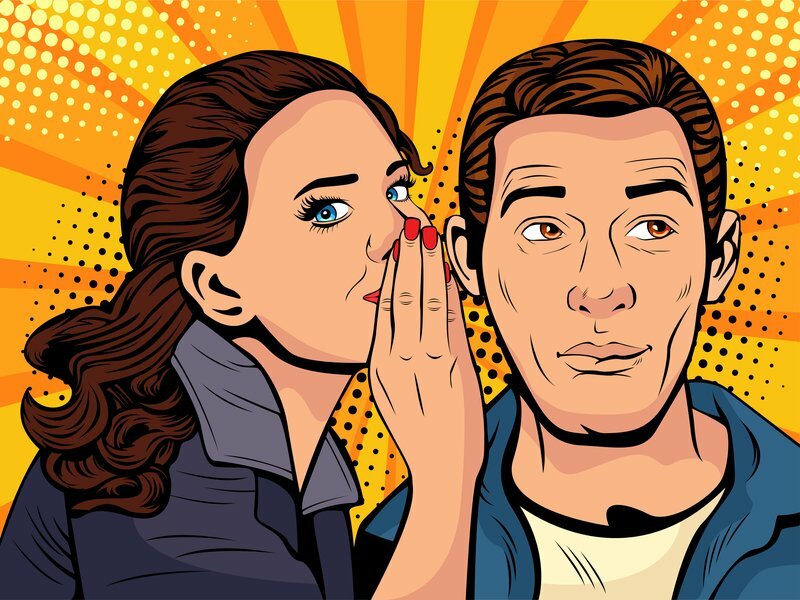 What I am really saying is that on a year to year basis, your retirement spending has to equal your retirement income plus money that you use from your savings (which could be from an IRA, 401(k) or 403(b)). One of the most important factors to consider when planning for retirement is what you spending is going to be. But, wait! Doesn’t the CFP® planner tell you how much you CAN spend? Actually, what we usually do is to look at your current lifestyle and unless you tell us differently, we will simply project your current lifestyle into the future. If you tell me that you want to retire to a smaller house in a cheaper location, I can take that into consideration. But you drive the conversation and then I find a way to make it work or tell you what has to change. We start with fixed payments: Things like housing expenses, taxes, car expenses, etc. Over a longer time period, fixed expenses can be reduced. For instance, you can downsize or move to a location with lower taxes, but that takes some time to change. You’ve read all the headlines about healthcare expenses. You know they’re going up and you have no idea how much healthcare might cost you in the future. You may be healthy now, but old age will eventually catch up and its possible your healthcare spending will increase. So how do I put this in your plan? I start with making sure you are well insured using Medicare and a drug and Medigap policy. I then make an estimate for what your typical out-of-pocket expenses might be. I include dental and vision expenses, generally not covered by insurance. I then inflate the numbers by a factor higher than the average rate of inflation I use for everything else. Now we have spending out of the way, how about income? 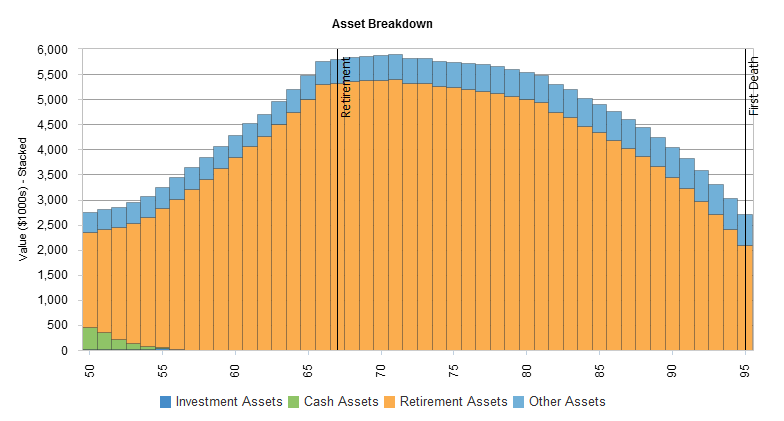 Retirement income comes from a number of sources: Social Security, Pension, and Savings are the high-level categories. Unless you’re a government employee in certain states or work for a railroad, you are probably covered by Social Security. Social Security is a very valuable benefit for workers because it’s guaranteed inflation-adjusted income. Your Social Security payment when you retire is based on the 35 years of highest earnings as well as the date you start taking payments. You are eligible to start taking reduced payments at age 62, but payments increase by about 8% a year if you start taking them later up until age 70. You can download a report from the Social Security Administration which shows your expected full retirement age monthly payments. When I talk about a pension, I’m really talking about a guaranteed monthly income from your employer. Its true that fewer and fewer employers are providing pensions, but its still common with public-sector workers. Small business owners also often have pensions, because they are very effective vehicles for business owners to save for retirement. A pension is extremely powerful for retirement income because it lasts as long as you live. You can’t outlive your pension income as long the entity sponsoring the pension is solvent. For many people, savings are the most important part of their retirement plan. You may have saved in your employer’s 401(k) plan over many years and enjoyed a match or other contribution from your employer. Other retirement vehicles include traditional IRAs, ROTH IRAs, or SEP IRAs. It’s also possible you have an after-tax investment account where you’ve saved a significant amount. Your savings may also be in the form of business ownership or investment real-estate. This savings balance can generate retirement income if the funds are invested. As I discussed above, your savings can generate income. You’re very lucky if you can live off your retirement income from pensions and social security without dipping into your savings in some way. If you take more from your savings than the income generated, you’re taking principal distributions. Its normal for most people to take principal distributions, but if you take too much from your savings, then your accounts will become depleted before you die. Once your savings are depleted, you will only have Social Security and any pension income. At the point when you retire, you will have your social security income, your pension, and your savings. You don’t know what the future will hold, but you need to know whether you have enough savings to last through your retirement. As part of the financial plan I create, I project your investment income and your principal distributions forward. I estimate whether you have enough savings and how much of your savings you need to deplete in an average year. I can forecast when you will run out of money, based on assumptions of inflation, investment return, and spending. So what does good retirement planning look like? Here’s a graph of what your accounts might look like in retirement when you don’t run out of money and you have a great plan. Here’s what happens when something goes wrong. This person spent down all their money at age 82. This was the result of very poor planning. If this person lives to an old age such as 95 (shown in the graph), they will have a very tough time between age 83 and 95. Every good plan needs to cover what happens when things go wrong. Your retirement might last 30 years or more and many things can go wrong. Fortunately, we can predict some of them and make contingency plans. Long Term Care is defined as custodial care needed when you cannot perform 2 out of 6 activities of daily life. Long term care is a risk because its not covered by Medicare. There are actually three ways to pay for Long Term Care, if you should need it: 1) Pay for it with savings or income; 2) Long Term Care Insurance; and 3) Spending down all your savings and going on Medicaid, the health insurance plan for the indigent. Medicaid does pay for long term care, but how well this works varies by state. The right answer for long term care planning depends on your personal situation, but the important thing is that you have a plan. It must be part of your retirement plan. Everyone knows about inflation, but the truth is that its been notably absent since the great recession. In the 1970s, prices rose by double-digits every year. Since 2008, inflation has been very subdued. Recently though, inflation has started to increase again. The latest figures for inflation were around 2.7%. Inflation hits retirees much harder than workers. That’s because pension and bond investment income is often fixed. Prices rise, but incomes don’t change and the buying power of your income goes down. When I create a financial plan, I assume a slightly higher rate of inflation and always plan for it. Keeping up with inflation is one of the reasons you need to invest your savings while you’re retired. Your investments can go up and they can go down. Poor investment returns are a particular concern to retirees because you can’t simply save more to make up for them. Its one of the reasons why retirees sometimes need to invest more conservatively than earners. One way to mitigate this risk is to simply have more savings, so poor returns don’t matter. Another method is to invest very conservatively. You can also use low-cost annuities to create a guaranteed retirement income stream out of a portion of your savings. The right answer will vary, but the possibility of poor returns needs to be in your retirement planning. I use statistical analysis which varies investment returns to ensure that the possibility of poor returns is incorporated in the plan. After reading this article, I hope you realize that there’s a lot that goes into retirement planning. I’ve revealed the secrets of what I do when creating a plan, but the truth is that you might not really be able to do this by yourself. A professional Certified Financial Plannertm is going to know the risks and pitfalls to be able to create a retirement plan you can rely on. Every individual’s situation is different, with different sources of income, different spending habits, different investments, and different goals. Only a financial plan customized for you by an unbiased CFP® fiduciary will be something you can have confidence in for your future. 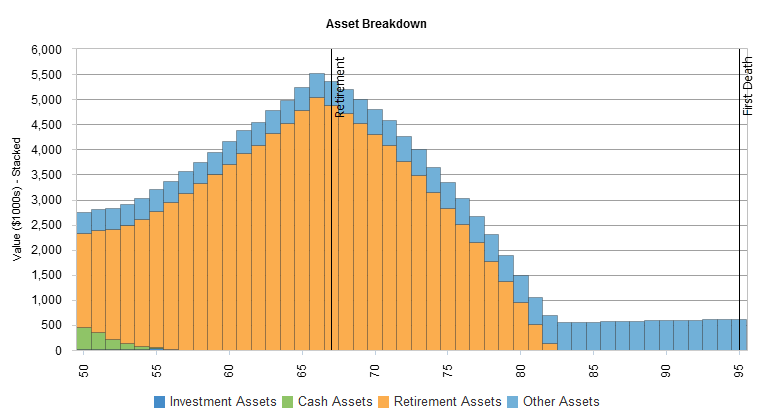 This entry was posted in BLOG and tagged retirement planning. Bookmark the permalink.